Yahoo! TV is featuring several premiere episodes of fall 2007 shows for a limited time only ahead of their broadcast debut. Unlike Amazon Unbox, you can't download them, but can only watch them in your browser. 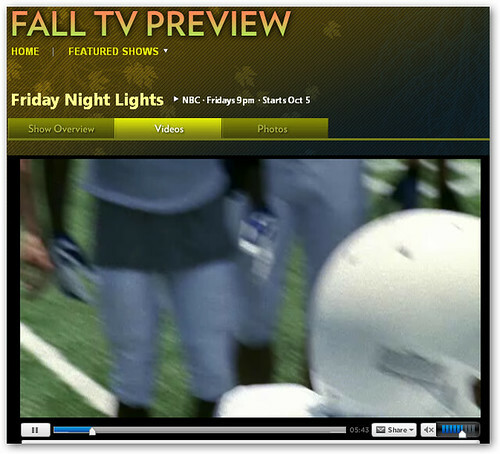 Shows that are currently available for viewing include sitcom "Aliens in America" and football drama "Friday Night Lights". They go offline September 30. Taking their place will be "Life is Wild", serial killer skein "Dexter", and mob drama "Brotherhood". The full episodes tend to last about one week online.